There's still little sign of the coal jobs boom that President Trump has promised. The U.S. added 400 coal mining jobs during May, according to Friday's payroll report. While those gains are helpful, they aren't enough to offset the dramatic job losses the coal industry has experienced in recent years. The U.S. now has about 51,000 coal mining jobs, a far cry from the 89,400 positions counted by the Bureau of Labor Statistics at the end of 2011. Another way to think of it: coal mining employs less than half as many people as struggling JCPenney (JCP), which listed 106,000 workers as of late January. Yet Trump and his surrogates have suggested a coal jobs boom is either here or in the works, thanks to the president's efforts to roll back job-killing regulations. "The mines are starting to open up," Trump said on Thursday during his speech blasting the Paris climate accord as a disaster for the U.S. economy. Stephen Moore, an economic adviser to Trump during the campaign and now a CNN contributor, has repeatedly claimed that more than 43,000 mining jobs have been added since Trump's November 8 election. Government statistics say otherwise. Just 1,700 coal mining jobs have been created since the end of October, according to the latest BLS stats. The broad "mining" category tracked by the government shows stronger employment growth, but the vast majority of those jobs are in the oil and gas extraction business, not mining. Coal country needs far more jobs to make up for the painful losses it has experienced. Coal jobs in Kentucky alone have plunged by 64% since the end of 2011, according to a Columbia University research report. Coal has been crushed by the shale boom, which has made natural gas -- coal's biggest competitor -- extremely cheap. The price that U.S. power plants have been paying for natural gas plunged 71% between 2008 and 2016, the Columbia report found. Coal prices were down just 8% in that same period. At the same time, coal faces new competition from the rise of renewable energy, including wind and solar. The falling cost of solar energy combined with federal tax credits have created a boom in solar jobs. The solar industry ended 2016 with 260,000 workers, according to the Solar Foundation. Environmental rules like the ones Trump is trying to reverse have certainly hurt coal. But regulation wasn't the main culprit driving coal's demise, according to the Columbia report, which means that deregulation is unlikely to spark a revival. Still, Trump is cheering signs of improvement on the coal front. In his Paris speech, Trump hailed the opening of a brand-new mine, correctly noting that's a rare occurrence these days. 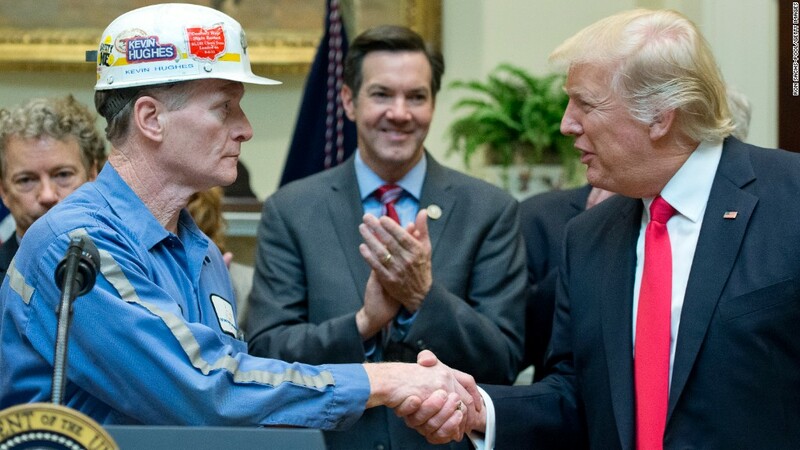 He was likely referring to the June 8 opening of the Acosta Coal Mine in western Pennsylvania. The facility will produce the type of coal used for steelmaking and it's expected to create 70 to 100 full-time jobs. Corsa Coal, the mine's owner, said it's invited Trump to attend the grand-opening ceremony. "I was elected to represent the citizens of Pittsburgh, not Paris," Trump declared on Thursday.